Hoping to get some input from those folks who are familiar with the output of the Matsumoku factory and Washburn's in particular. I know there are fans of the solid body wings and A series, who may not be as familiar with the HB-35's. Older HB's are often coming up for sale, and their origin is always hazy, due to MANY variations within the eighties...string through vs. tone-pro style bridge, wing vs. Gibson style bound headstock, 4 digit serial #'s vs 6 serial numbers...and lastly, where they were built. I've read that Matsumoku ONLY built solid body electrics for Washburn. does any one know if this is true? One reason I'm trying to get to the bottom of this is that I've seen listings on ebay where the seller clearly and emphatically states the HB for sale is made by Uncle Mat...and is asking over a grand for the guitar...I'm thinking he's full of it...but I could be wrong. As a vivid member of matsumoku.org i at least have come to take notice of the current uncle mat fever thatÃ‚Â´s seems to be on the rise. LetÃ‚Â´s just say that in the recent year the asking prices of the genuine article seems to have gone up 100%. Especially so with the Aria and Washburns. We see more and more claims of given guitars to be made by matsumoku,and what makes it hard to distinct is that in some instances these claims are correct. In short,by far of all Uncle Mats productions has yet been referenced. Hence,you should to this day regard the pages of the library of matsumoku.org as guidelines more than anything else. When it comes to the washies made by Yamaki and Matsumoku i for one at least think that some of them are downright world class,top notch gutars by any measure.To the point of pure custom shop stuff. However,to determin whatÃ‚Â´s Yamaki/Mat and whatÃ‚Â´s not can sometimes be a harder than it looks,and itÃ‚Â´s IMO not really until you pick the axe apart and ontop of that carry a certain amount of knowledge of these guitars that things become certain and evident. In the case of the HB above my answer on both counts would be no though. Main reason is that the logo and headstock form canÃ‚Â´t be found on any of the other Yam/Mat Washies-right off the bat. You can clearly see how these HBs share inlays,headstock form,hardware asf with the highend wings. I recently picked up a Washburn W24BBR-V super tele. Upon examination this axe shows more and more signs of being yamaki. BBR fÃƒÂ¶r black/black/red,and within that series of guitars we for instance also find the A20BBR. Good friend Oscar just bought one of those,a BBR-K(for kahler altho it sports a wonderbar)and that axe no doubt is a setneck Uncle Mat to our findings. Nother friend,TorbjÃƒÂ¶rn,in turn owns an A20 that he suspects to be Yamaki too....and nother friend Tommy owns an A20 that we both suspect to be Uncle Mat. What gives here,and can really any basic conclusions be made? Not as far as weÃ‚Â´ve concluded at least,and hence which is which seems to be a point of disecting guitar per guitar. Build quality and attention to detail of the Yamaki guitars in general tho seems to be a notch higher. NOT better guitars than the Uncle Mats,but they indeed seem to be put together more with that last touch in mind. The bindings of my Yamaki made Eagle for instance are made out of separate pieces of brass coupled with mahogony. Now...the brass of the neck could basicaly be used for a straight edge if need be,and the general attention to detail of the axe simply doesnÃ‚Â´t come out until you play around with it IRL. A super build in my book.. Neither the HBs or for instance the HM guitars are speced as Mat by the library. What i CAN tell you from own experience is that some HM series guitars with 100% certainty was made by Matsumoku. Ie,again...dont read into the specs to the letter. 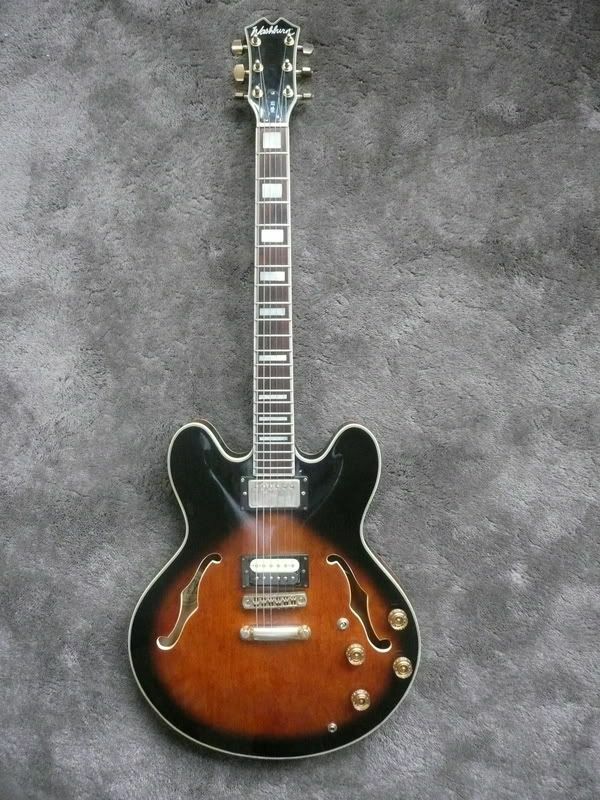 Racing, are you aware of Matsumoku making semi hollow or hollowbody Jazz style guitars for anyone, Washburn or otherwise? You see the -35 with the classic round ears and the wing style head stock, and right next to it, the HB-60 with the gibson style headstock. At this point in time, Yamaki was still a manufacturer, and had been building Acoustic Washburns for years. I've heard it said that 35's were built Japan through '92. So I'm going to take a leap, since Yamaki was making acoustics from the late 70's for washburn, and the HB style is of a manufacture more similar to an acoustic than to a solidbody..wouldn't it have made sense for Washburn to have it's solids built in one shop, and it's hollow's in another? But, on the other hand, Racing states that he is aware of solids being built by Yamaki, so it could go either way?! For Aria they even made a model called FS,which something as obscure as a neckthrough semi. Have had the pleasure to try both the FS750 and the FS1000 Aria Pro IIs and those are for sure highend jap guitar craftsmanship at the highest level. I donÃ‚Â´t know where that rumour that Matsumomku burned down origins,but for all we know this is NOT true. Matsumoku closed shop due to economic reasons in 1987. That the semi Washies depicted would be japanese of orginins...donÃ‚Â´t be so fast to conclude that-altho it might very well be correct. At the time lots of hardparts were shipped to the at the time up and rising Korea to have complete guitars manufactured. These early Korean guitars often of rather high quality and build. Couple of easy things to check are the pots and the caps. Take the lid off at the back and write the numbers down. Check what colour the caps are. Not conclusive by far,but if they are the wrong colour and markings they aint uncle mat for sure. Hey racing what color are the caps suppose to be, what lid are you talking about? Tio Kimo; Maybe we should also focus on the label colors and designs of all Washies of the MIJ years. The label on my 01 Korean HB-35 is certainly different my 89? HB-35. I will continue scanning eBay and Craigslist looking for original owner HB's maybe some useful info will be stated and I will ask questions. Do you know when they changed the head stock designs, perhaps they used both designs but at different factories. TIo Kimo; that ad you posted states Mahogany neck on the HB-35, I suspect mine is Mahogany but that head stock I've never seen on an HB-35 that I can recall except on a string through. All of the older HB-35's I have seen post string thru models have the Dove Wing style headstock. I can see the research needs a lot more work. Surely there must be someone that can shed some light on the mystery since it wasn't really all that long ago. THAT is how I feel about my Washburn J6. I want to share something with you. I used to work for Gibson over at 7373 Cicero Avenue in Lincolnwood, Il in 1956 and so was very familiar with their quality (incredible standards -- every guitar perfect). BUT whoever made this Washburn J6 guitar did exactly that kind of a guitar and I have owned it and played it all these (21) years. I don't think THEY could make for the price I paid new (I did not realize the factory burned down) They guitar is world class (and I just played a 4 hours session at a La Jolla pool party and they all were raving about the guitar (my music) and the band. Earlier in the afternoon I had lunch with my daughter and son in law and I asked them NOT to give the Washburn or the Hamer to my grand son before he was 25 because I do not want them trashed. I have no intention to sell them. I have four acoustrics .. he can have my washburn D10 or my Tacoma DM10 (but not the Gibson J-100 until he's 25). 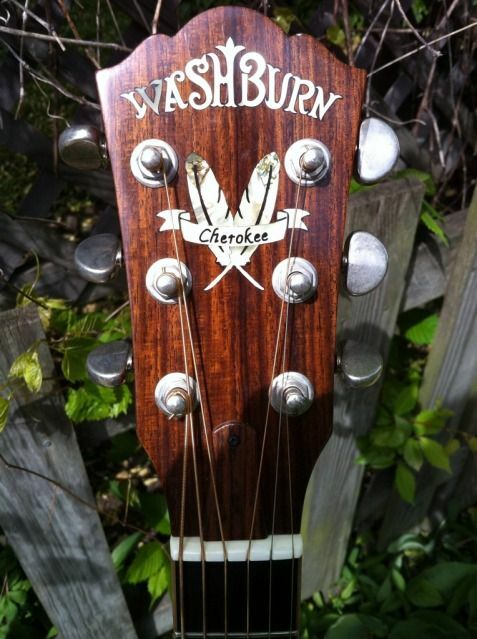 (I also have a Yamaha FG04-Ltdd) Washburns are EXCELLENT GUITARS .. the J6 is an L5 -- it is a clone. Welcome Gitfiddle, are you the original owner of your Washie? The reason I ask is because there is some question on the first 2 digits of the four digit serial numbers being the year built. Can you post some pics of the J6? A few things we have determined is that six digit serial numbers were used on string through HB-35. then there was an unknown period of time that four digit serials were used then the six digit serial reappeared, like mine 899xxx. 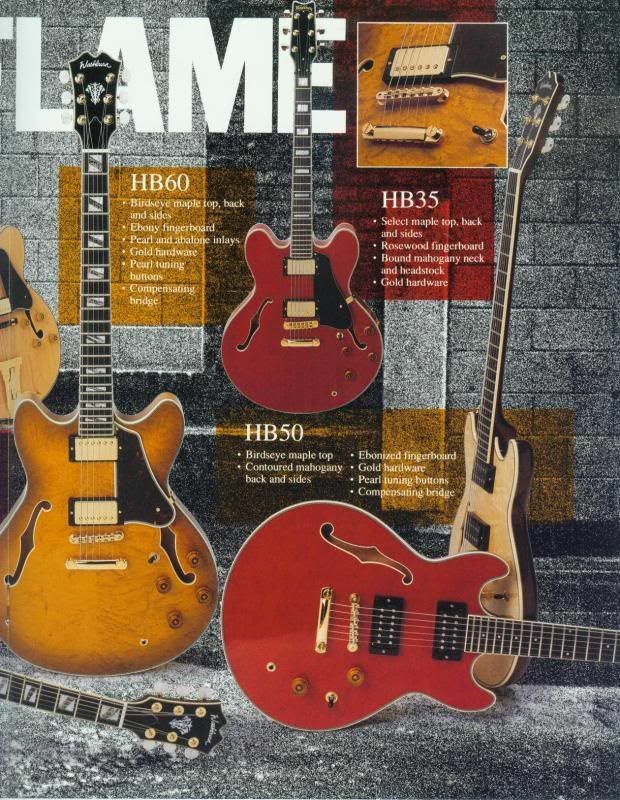 Tio Kimo's HB-35 serial is 81xx, his guitar certainly is not an 81 model as they were string thru models. Perhaps the serial has nothing to do with the year and is only the production or work order number. For instance if the first 2 digits are the year then it leaves serial numbers for only 100 guitars a year, about two a week being build which would be small production. On another note about gibby's I had a 2002 Les Paul, the bridge was installed 3/32 too close to the fingerboard and had to be moved back before it could be intonated. Dan Erlewines book on guitar repair addresses this and it was a common problem according to him. The guitar is a lot prettier than the pictures show .. the two bands I play in are Swing Street and the Saints -- and the song books are on the shelf. LOL. Notice the tailpiece is a Gibson L5 type tailpiece and the fretboard is a copy of Gibson and really nice .. beautiful. The pearl seems to be real pearl and also beautiful. The toggle switch is oin a different location than the L5. Ove the years I have had several set ups and I had the frets dressed once .. probably will get a fret job at some point and I am thinking about SD SH55 Seth Lovers -- all of that about $500 (but to me the J6 is priceless so I do not care about having a newer guitar -- I like this one. I have a newer guitar (Hamer Newport Custom Pro -- wow .. that's perfect .. that is a dream) http://www.hamerguitars.com/pics/models/NEWPROCRRG_sm.jpg BUT very expensive. I prefer the tailpiece to the Bixby or the LesPaul bridge on a hollow body because the stress is transferred top the end. A thrill to play it. SO here are TWO incredible electric guitars. I have asked my daughter not to give them to my grandson until he is 25 so they will not be trashed. I am not planning on leaving any time soon and I will not sell them (be sure of that). My gut feeling is that guitar prices are going to quadruple as the dollar crumbles. Any opinions abolut Seth Lovers? Tio/Jonson,my bad about the lid. DidnÃ‚Â´t think semi but solid. Caps for an Uncle Mat are always either matte green or maroon.Always marked with capacitor value,and the text soon enough sets them apart. Pots are matte and marked with resistance value and type(A/B),and then sort of a date/serial.The latter not always applicable however. Outputjack is a single prong type-that in turn often loses tension over time. Insulators for the jack are out of what we over here at least call backelite-a composite used since the 50s. Altho there are a multitude of pups made by uncle mat most of them boil down to being marked MMK followed by a suffix. MMK more often than not etched and the suffix printed. There are exceptions to this though. Like the proto1s that lack any and all markings and for the Yamakis the ones in the wings that mainly also lack markings. The Yamaki pots are often of push/pull variety and these look a little different than the current generic ones. Yamaki used caps that looked a little different to the Mat ones as well. ThatÃ‚Â´s a short summary that should NOT be taken to the bank due to the most famous sentance of them all with Uncle Mats. ThereÃ‚Â´s more tell tales for Uncle Mats than that,but let that suffice for now. Gitfiddle, very nice guitars you have. Racing thanks for that info. My HB-35 from what I can see with my inspection cam, has green caps couldn't get a good view of the markings, brownish spaghetti insulation, pots marked 500 k on the side on the back is lettering partially covered by soldering of the ground wire, I couldn't get a good view of the jack, the f hole is to small to maneuver my cam very much. I'll check the pups next restring. Checked inside my HB-35 again, still cannot make out the caps, the pots are mini's, checked stewmac and all pots they carry for arch tops are the mini.